This recipe is an example of a dish that can be made in advance and frozen. 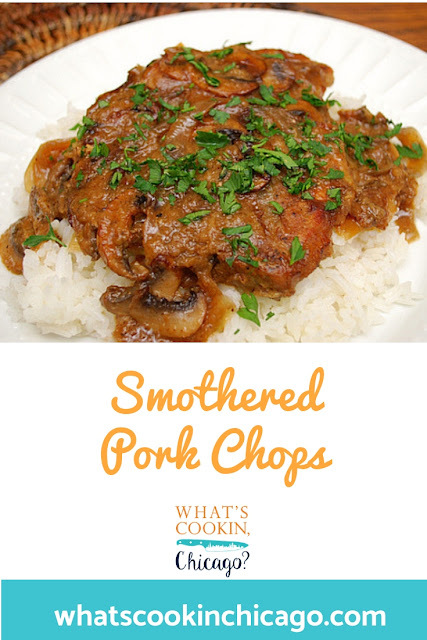 Essentially, it's a flavorful pork chop recipe prepared on the stovetop and then finished in the oven as it reheats - if you're preparing it for the freezer. Otherwise, the original recipe calls for preparing the entire dish all on the stovetop. 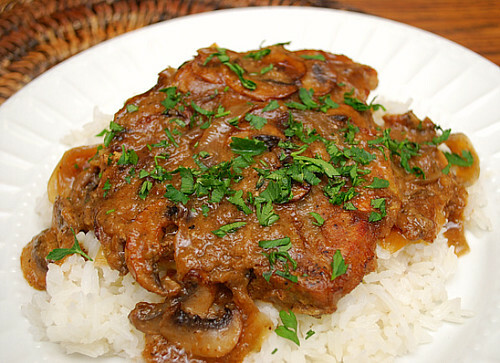 I thought this was a really good dish and my husband picked up some flavors reminiscent of a chicken marsala, only with pork. Aside from preparing this for the freezer, the only other change I made was adding sliced white button mushrooms for more depth of flavor. Feel free to omit the mushrooms all together if you wish. Fry bacon in small saucepan over medium heat, stirring occasionally, until lightly browned, 8 to 10 minutes. Using slotted spoon, transfer bacon to paper towel-lined plate, leaving fat in saucepan (you should have 2 tablespoons bacon fat; if not, supplement with vegetable oil). Reduce heat to medium-low and gradually whisk flour into fat until smooth. Cook, whisking frequently, until mixture is light brown, about the color of peanut butter, about 5 minutes. Whisk in chicken broth in slow, steady stream; increase heat to medium-high and bring to boil, stirring occasionally; cover and set aside off heat. Heat 1-tablespoon oil in 12-inch skillet over high heat until smoking, about 3 minutes. Meanwhile, dry pork chops with paper towels and sprinkle with 1/2-teaspoon pepper. Brown chops in single layer until deep golden on first side, about 3 minutes. Flip chops and cook until browned on second side, about 3 minutes longer. Transfer chops to large plate and set aside. 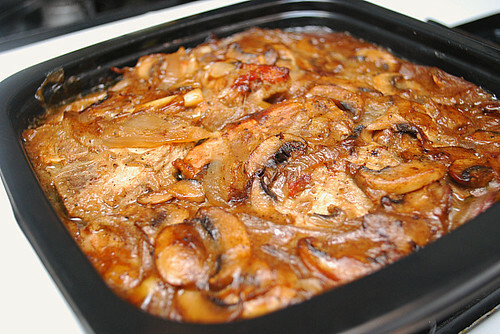 Return chops to skillet in single layer, covering chops with onions and mushrooms. Pour in warm sauce and any juices collected from pork; add bay leaves. Cover, reduce heat to low, and simmer until pork is tender and paring knife inserted into chops meets very little resistance, about 30 minutes. Transfer chops to warmed serving platter and tent with foil. Increase heat to medium-high and simmer sauce rapidly, stirring frequently, until thickened to gravy-like consistency, about 5 minutes. Discard bay leaves, stir in parsley, and adjust seasonings with salt and pepper. Cover chops with sauce, and serve immediately. * To make ahead/freezer meal - You will need to ensure the pork chops are cooked until the internal temperature is 145 degrees if you want to freeze them. Instead of returning chops to the skillet as noted above, place chops in single layer into an oven- and freezer-proof baking dish, covering chops with onions and reserved bacon. Pour in warm sauce and any juices collected from pork; add bay leaves. Allow to cool completely before covering and freezing. When ready to prepare, defrost completely. Preheat oven to 350 degrees and place baking dish uncovered in preheated oven. Bake for 30 minutes until pork is tender and paring knife inserted into chops meets very little resistance, about 30 minutes. Continue by transferring the chops to a warmed serving platter and following the last step as noted above. Loved this. Posted it on our blog. Part of my "try 1 new recipe a month" goal. Are the bacon pieces supposed to be added to the dish later? Or are they cooked just for the purpose of using the fat? I made this last night, it was AMAZING...the whole family loved it, even my picky 6 year old! Mine didn't come out with much of a sauce after I baked it (following the freezer directions). Some has even burned into a clear film with dark edges at the bottom of the pan. I can't see a step that I missed and I'm not sure what I did wrong. I did divide it into 4 1-person sized meals instead of a family meal... should I increase the amount of sauce I make, since I will divide it into 4 and all of the sauce will not be cooking all at once? I think that making more juice/sauce would be better. I used 2 cups of broth, and added extra water when I was cooking the onions, garlic and thyme. I didnt use the bacon, I merely used oil but I am sure the bacon fat would make it very flavourful. This is a great recipe!! If you want to increase the sauce its 1tbsp of flour per 1tbsp of fat/oil for another cup liquid. The pork chops were dry but the sauce was very tasty. I would do the sauce the same next time but do thin cut boneless pork chops seasoned and seared for 3 minutes on each side. The chops are very juicy this way. Over all one the best recipes I've tried in a while. I wasn't sure what to do with the bacon, as there weren't any instructions on when to add them. So I spinkled them on top when I was ready to serve. This was a decent recipe, however, I should have made the sauce thicker. I always want to follow recipes as directed, but a thicker sauce.would have made this better..
Hi All! The bacon was used to just render the fat to cook with but I added the cooked bacon, chopped it up and stirred into the final dish. This is identical really to a recipe from Cook's Illustrated's website and I watched an episode of CI which made this dish, only they made several changes. They omitted the bacon fat and used all veg oil, used beef broth instead of the chicken broth, braised the dish in the covered skillet in a 300 degree oven, then removed the chops, strained the onion and thickened the broth back in the skillet with some cornstarch to a sauce consistency, not a gravy consistency. Then they put the onions back and plated the chops with a generous slather of sauce. It was quite delicious, except my husband, who is not a French Onion soup fan wasn't sure about the heartiness of the broth as it truly was like French Onion Soup. I think the Chicken broth would make a great change to this dish. Also, before browning the chops, they used a rub of onion powder, paprika, salt & pepper and a touch of cayenne pepper. Used this to rub the chops, then browned them. We loved the rub, but didn't care for the heat of the cayenne. Next time, I'd leave that out. I think the sauce would be nice with a finish of melted butter swirled in the pan. Anyway, thanks for posting this other option - I am a huge Cook's Illustrated Fan! Hi Joelen- I love this idea but was wondering- is it safe to sear or partially cook the chops, then freeze and finish cooking later? I've heard mixed responses to this. I've read a lot of other cooks' posts that do this, but then seen several posts that say this is a big no-no. When and why is this ok/not ok? Hi Colleen! When I cooked my pork chops, they were already cooked fully to an internal temp of 145 degrees. That said, the chops were cooled and prepped for the freezer. This is safe and is what is standard policy which is what is practiced for food health & safety when I was formally trained. However if the pork chops are not an internal temp of 145 degrees prior to freezing, then no - it would not safe. 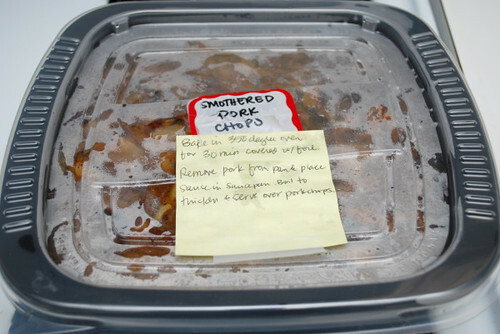 The freezer directions above note that the pork chops must be fully cooked and cooled before freezing.